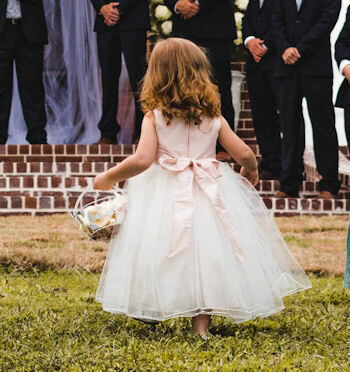 In my role as celebrant (officiant) at hundreds of weddings involving a flower girl, or three, and a petal toss, I've seen every possible variation, but actually rarely an exuberant abundance of petals flying through the air to land on the aisle carpet. It is much more common for children to carefully select one petal at a time, and to take great care in dropping that petal. As with everything involving children, this is a wedding ritual that needs multiple rehearsals, which is where Mum and Dad come in. Step One: gather together petal substitutes. These could be cheap silk petals from the $2 shop, cut-up tissue or other paper, or even torn-up bits of newspaper. Step Two: fill the actual basket the child will carry on the day with these substitute petals. Step Three: before trying a hands-on rehearsal, have some discussion about why petals are being scattered and why they need to be thick on the carpet. Step Four: keep emphasising that it isn't making a mess and that big handfuls are the go! Step Six: Have a petal shower - just for fun, tossing the petals into the air so that they float down as you both walk through them. Step Seven: keep practicing, including a last minute minute practice with a few extra real petals so she gets used to the feel of them. Step Eight: step back and leave it up to the child. Whatever she does will be a photo opportunity and will add so much fun to the entrance of the bride.